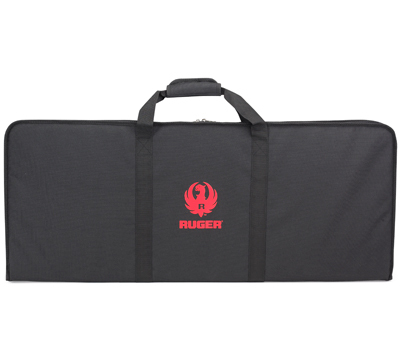 Black tactical bag with ½" foam padding for the SR-556®, SR-762®, SR-22®, and the Ruger Precision® Rifle. Features include three Velcro straps for positioning, three interior magazine pouches, outside pouch with Velcro closing and a double strap carry handle. Bag has a red Ruger hard-R logo on both sides. Exterior dimensions 15" x 38". Interior dimensions 14" x 37-1/2". Nice bag, needs more magazine room. Over all a nice bag, fits well and the Velcro straps secure the rifle nicely. I wish the magazine pouches were a little bigger. You can fit one 30 round mag in each with room to spare, but not enough room for two each. All they need is maybe another quarter inch or so. I have not had any issues with the zipper that others have talked about. I must say though that I have only taken it to the range a couple of times. Very disappointed in the low quality construction. Ive purchased several bags for my ARs over the years and this is least practical. Handles are thin and there are no pouches on the outside for mags. No place to clip a shoulder strap. You can buy a better looking and more function bag at Midway for the same or less money. The AR556 is nice though. The zipper broke the first time i took it out to the range.Not a very good product coming from ruger. Ruger ran a special on this rifle bag and I had just purchased a Ruger AR 556 weeks before.Love the rifle bag, fits the AR 556 perfet and has pouches inside for extra mags.Has a pouch on the outside so I can carry my SR1911 CMD to the range with it. Came with my SR556 2 years ago. No problems. No complaints. Awesome bag. i love my bag . it looks great. You need to open the zippers all the way ,or it will put stress on them. Do that and it will last many years. I cant tell you how much i love my Ruger AR-15 556. well built and all American what more could you want. God bless Ruger for its quality and service. One of the zippers pulled off. The end of the zipper was raveled and the zipper pulled off the end.